Last week I wanted to try a restaurant called The Oinkster, located in Eagle Rock, California, my old college stomping grounds. 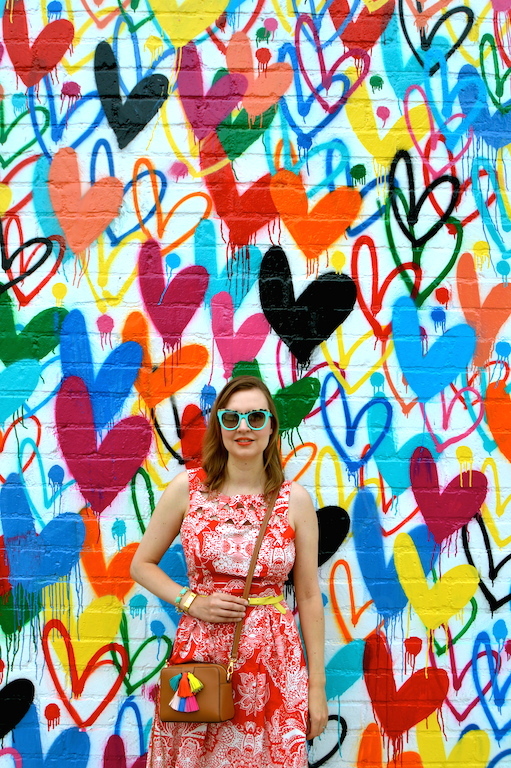 Before I went, I Googled "cool walls in Eagle Rock" and happened upon this heart wall. 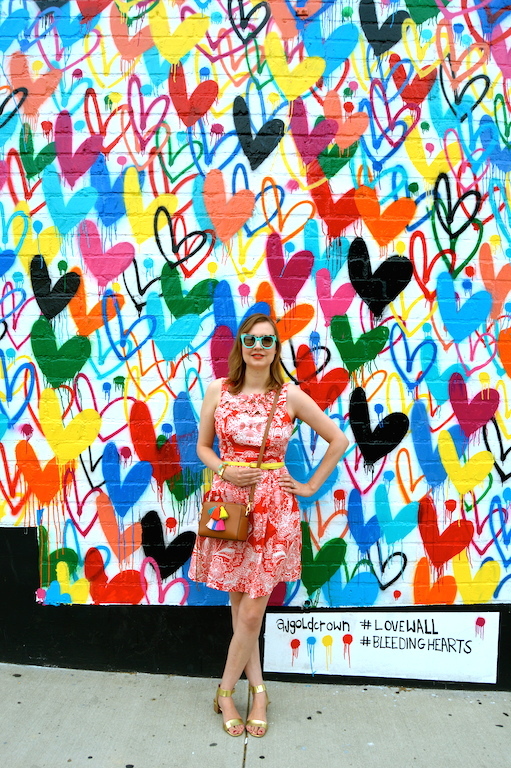 Sure, I had already visited a similar heart wall in Atwater Village last month, but this one with "bleeding hearts" was even more colorful and cool than the aforementioned wall, in my opinion, so I had to check it out. Unfortunately, there was no information given about where it was located other than the city, so I metaphorically put on my deerstalker hat and did some investigating into this mystery. The search was afoot! My investigation took me on a wild goose chase that started with a blog that mentioned the artist's name who created the mural. I then searched on the artist's website for more details about the location, but none were given. What made it even more difficult is that the artist had created numerous "bleeding hearts" murals, so it was hard to pinpoint this exact one. Finally, I found a picture of him in the process of painting the wall on Instagram and noticed a sign for a fitness center in the background. It was just the clue I needed! I did a search for that business and finally discovered where my much coveted wall was located. (Oh, the lengths I will go to to find a good wall!) I think at the end of the summer I am going to put together a "wall guide" to the Los Angeles area for fellow bloggers who want more exact locations on the walls I have discovered in my travels around the city. If you like my dress, don't get too attached to it because I will not be wearing it again due to the zipper breaking. When I was putting it on, I heard the sound of something tearing. My husband then realized that the zipper had broken when we were heading out the door. (This is what happens when you buy a dress for $7 on a clearance rack at Forever 21, but I think I've worn the dress a few times so that's not too bad in terms of "cost per wear".) Anyway, I wasn't about to change despite the broken zipper, so I told my husband to watch my back for any gaping as we headed out for our adventure in Eagle Rock. Luckily, I don't think the wardrobe malfunction I experienced was noticeable, so it was all good, including the food at The Oinkster, which I highly recommend to anyone who is in the area. Oh my goodness what a darling post! Love all the bright colors! You are dedicated when it comes to wall hunting! Your efforts paid off though, I love this awesome wall and how (as usual) you coordinate with it perfectly. What a bummer about the dress, that is totally the kind of thing that happens RIGHT before you leave to go somewhere, right?! Totally worth the effort for that walll! 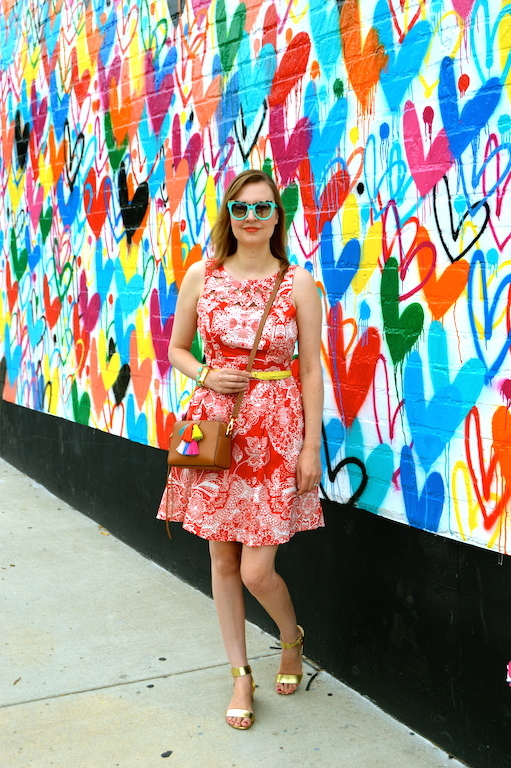 Love the fun prints and colors together! You seem to always find the best backgrounds for blog posts! 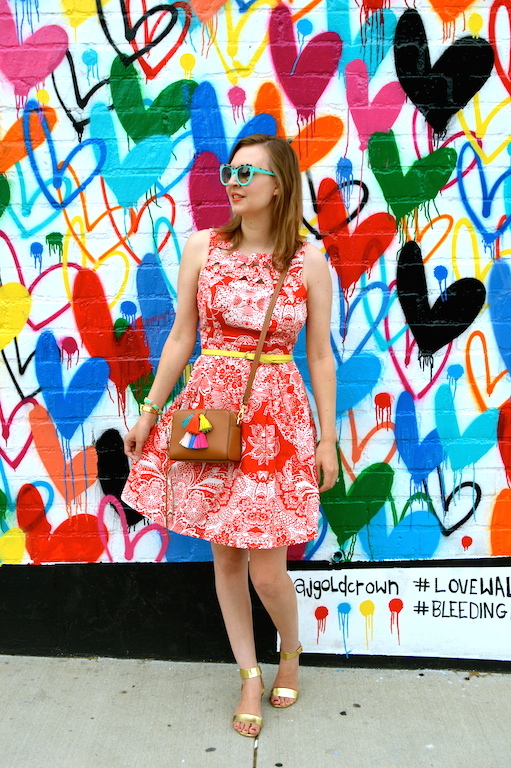 Love your dress it is cute and fun. This wall is amazing! And so is that bag! Sorry that your dress ripped though! Great you found the wall you were after too, it's a great backdrop for photos! 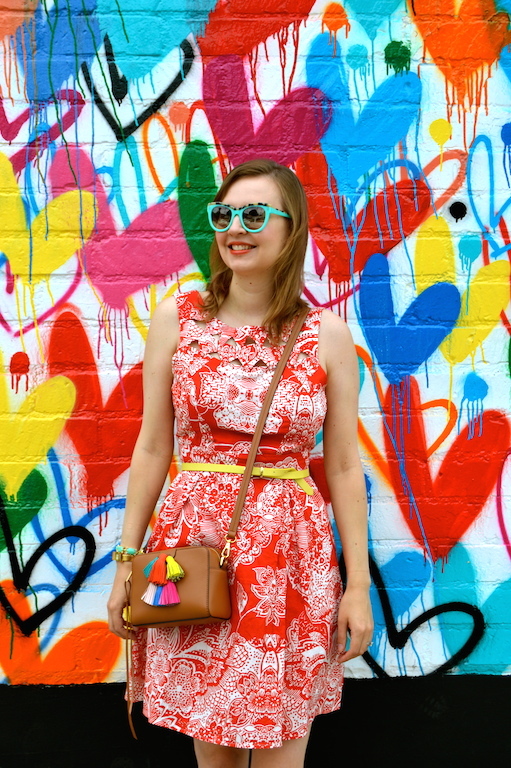 There are so many places in L.A. that I still need to visit, including this awesome wall (that matches your bag so perfectly). That wall is beautiful! Nice detective work! Too bad about the zipper because that dress is super cute! Your search paid off because this is such an epic backdrop! Adore that pom pom purse too! That's too bad about your dress! It's adorable! Way to go with your sleuthing and finding that wall! Glad your search for the wall was not in vain, these photos came out perfect, and I'm glad even with the broken zipper you made it through the day. I live right up the street from this wall and enjoyed watching the artists in action with their many colored paint cans. Wonderful post. Pity about the dress -- very cute! You always find and hunt the best walls. This and the dot wall are my favorites so far and I will be looking for your wall guide soon. I think this cute dress is worth changing a zipper for!